The Drug Information Association (DIA) and the US Food and Drug Administration (USFDA) will host Assessing Benefits and Risks of Medicinal Products in Regulatory Decisions from November 3- 5, 2009 in Bethesda, MD. Carnegie Mellon University; Chair, FDA Risk Communication Advisory Committee, will deliver the keynote address. DIA serves more than 30,000 professionals involved in the biopharmaceutical industry and regulatory affairs worldwide. Through its domestic and international meetings, training courses, workshops and webinars, DIA provides a neutral global forum for the exchange of information critical to the advancement of the drug discovery and lifecycle management processes. Headquartered in Horsham, PA, USA, and with offices in Basel, Switzerland, Tokyo, Japan, Mumbai, India, and Beijing, China, the Association is led by its volunteer-based Board of Directors and executive management team. For more information, visit www.diahome.org or call 215-442-6100. St. Helens U.K. (PRWEB) September 30, 2009 -- 3BView, a global leader in metadata removal, today announced they will be conducting a survey aimed at attorneys to better understand how mobile devices are being used in their day-to-day practice. "We are seeing a significant increase in the use of business applications via mobile devices by attorneys," says Cathy Brode, Founder and Vice President of Product Marketing at 3BView. "Our goal with this survey is to better understand the way these devices are being used, so we can ensure the attorneys who are using them are not putting their data or their practices at risk." Our goal with this survey is to better understand the way these devices are being used, so we can ensure the attorneys who are using them are not putting their data or their practices at risk. The sophistication of today's mobile devices such as Blackberry, iPhone, PDAs and Netbooks now presents a practical and cost-effective alternative to laptops. Leading mobile devices can access internal systems and business applications, and enable the review, edit, and forwarding of documents. This survey is focused on understanding how these business applications and these devices are being used. The survey is available for all legal practitioners. They can access the survey at http://www.zoomerang.com/Survey/?p=WEB229PNSVQD9C through October 23, 2009. All participants will be entered into a drawing to win an upgraded phone of their choice - either a Blackberry Storm 9530 or an iPhone 3GS 32GB. Results will be available after the survey has concluded to all participants who request final results. 3BView is a global leader in metadata removal across multiple device types and access methods, enabling enterprises and government agencies to secure their documents, avoid commercial and reputational risks, and comply with regulatory requirements. For more information, please visit www.3bview.com. Reeves College grads help keep community safe. We cover Real Estate, Insurance Law, Litigation and Criminal Law just to name a few. Our graduates have gained employment in law offices, the court system, government and insurance. Calgary, AB (Vocus/PRWEB ) September 30, 2009 -- With crime a reality for most communities, citizens increasingly turn to legal professionals to keep them safe. Having someone who understands the law on their side makes protecting themselves and their property a lot easier. For people interested in a career in the legal field, Reeves College offers two comprehensive diploma programs that produce knowledgeable and skilled professionals. Students of Reeves Legal Administrative Assistant and Paralegal diploma programs are taught how to work and think independently, which helps regular citizens get the help they need as soon as possible. With a system full of well-trained legal professionals, Albertans can breathe a little easier knowing there is a framework in place to help them when they need it the most. For those who are interested in career in law, Reeves College offers the comprehensive Legal Administrative Assistant diploma program that can be completed in less than a year. For more comprehensive legal training, the college offers the Paralegal diploma program which can be completed in just two years. Reeves College is currently accepting applications for both their Legal Administrative Assistant and Paralegal programs. More information on this program is available at http://www.reevescollege.ca/Campus_Programs/Legal_Programs. Reeves College (www.reevescollege.ca) has provided market-driven career training programs in Alberta since 1961. With five college campuses in Alberta, Reeves offers a comprehensive learning experience that opens up a world of opportunities for their graduates. The diverse curriculum and consistently high graduate employment rate have established the college’s reputation as a leading private career trainer. This program complements our associate degree in paralegal studies and our bachelor's degree in legal studies and will help students continue their study of the law. Charles Town, WV (Vocus/PRWEB ) September 30, 2009 -- American Public University System (APUS), introduced a Master of Arts in Legal Studies to broaden its program offerings for students interested in expanding their academic and professional development by studying legal doctrine and concepts. APUS also offers a Bachelor of Science in Legal Studies and an Associate degree in Paralegal Studies through its member institutions American Public University and American Military University. APUS is one of only a handful of institutions to offer a legal studies program completely online. An accredited, online, university system, APUS serves more than 50,000 working adults studying worldwide. It offers 75 undergraduate and graduate degree programs in an affordable and flexible format. The Master of Arts in Legal Studies is a 36-credit degree program designed for students who wish to develop a better understanding of the law as it affects their careers, but are not interested in practicing law. The program prepares its graduates to pursue career opportunities in law and law-related fields in both government and business, or as a background for future graduate work. The program in legal studies does not prepare students for the practice of law, and graduates of this program are not eligible for admission to the Bar of any state based solely on their completion of this program. "We think it's important to provide a path for continued growth in our programs," said Wallace E. Boston, Jr., president of APUS. "This program complements our associate degree in paralegal studies and our bachelor's degree in legal studies and will help students continue their study of the law." Classes range from Criminal Law and Advanced Legal Research and Writing to Islamist Lawfare and Contract Law. Upon completion of this program graduates will have a solid foundation in legal doctrine and concepts and an expanded ability to identify and analyze legal issues within the workplace environment. Professionals most likely suited for this program are paralegals, law enforcement officers, issue advocates, practitioners in dispute resolution, and other professionals who want to better understand how legal issues impact their roles and responsibilities. APUS is committed to keeping the cost of attendance low with a graduate tuition rate of $275 per credit hour. Classes start monthly, with Legal Studies courses offered in 8-week sessions. For more information on degrees in Legal Studies, call 1-877-777-9081 or go to www.apus.edu. American Public University System includes American Public University and American Military University and educates more than 50,000 adult learners worldwide. APUS's relevant curriculum, affordability and flexibility helps working adults pursue degrees in subjects ranging from homeland security to management and liberal arts. A university book grant supplies textbooks at no cost for eligible undergraduate students. New York, NY (PRWEB) September 30, 2009 -- Less than three months after the public launch of Boliven (www.boliven.com), the company announced that its membership has grown to over 2,000 professionals with growth accelerating in recent weeks. "Over the last two months we were pleased to see how many of our members are finding value in having a Work Portfolio™ of their patents, publications and other work experience on Boliven. Through the Work Portfolio™ and Your Innovation Network™ features, our members are finding out how easy it is to reconnect with clients and colleagues who already trust their work to develop new client and partnering opportunities," said Thomas Lehrman, Founder and CEO of Boliven LLC. Companies: Accenture, Adobe, Airbus, Amgen, Areva, Boston Scientific, CPA Global, Dow Chemical, Dr. Reddy's, DuPont, Fujitsu, Genentech, General Electric, IBM, Intel, Jabil Circuit, Johnson & Johnson, L'Oreal Group, McKinsey & Company, Micron, Microsoft, Millipore, Mitchell Madison Group, Praxair, Procter & Gamble, Repsol, Rohm and Haas, Sasol, Schlumberger, Thomson, Tyco Electronics, W.L. Gore & Associates, Xerox, among many other research and technology oriented companies. Government: Korea Intellectual Property Office (KIPO), State Intellectual Property Office of the People's Republic of China (SIPO), National Aeronautics and Space Administration (NASA), US Patent & Trademark Office, U.S. Department of Commerce, U.S. Department of Health and Human Services (FDA), U.S. Department of State, U.S. Department of Energy (national laboratories), U.S. Department of Defense. Law Firms: Akin Gump; Bryan Cave; Cooley, Godward, Kronish; Covington & Burling; DLA Piper; Foley & Lardner; Kirkland & Ellis; Nixon Peabody; Ropes & Gray (Fish & Neave); Winston & Strawn, along with many specialty technology and intellectual property law firms. Universities: Caltech, Cambridge University, Columbia University, Cornell University, Dartmouth College, Duke University, Georgetown University, Harvard University, Massachusetts Institute of Technology, Oxford University, Princeton University, Stanford University, Yale University, University of California, University of Michigan, University of Pennsylvania, University of Texas (MD Anderson), University of Virginia, among other leading U.S. and foreign research universities. Founded in 2007, Boliven is a free professional network built on the trusted foundation of over 100 million peer-reviewed and public record documents. Boliven helps users discover and develop new client, partner, and career opportunities through Your Innovation Network™, the professional network users have already built but never knew they had. The Masters Conference, an advanced legal educational experience, would like to announce that Deloitte will be presenting a speaking panel at the 2009 event, "Global Corporate Change - Navigating Discovery, Risk and Security." The conference will be held October 13-14, 2009 at the Ronald Reagan Building in Washington, D.C.
Orlando, FL (PRWEB) September 30, 2009 -- The Masters Conference, an advanced legal educational experience, would like to announce that Deloitte will be presenting a speaking panel at the 2009 event, "Global Corporate Change - Navigating Discovery, Risk and Security." The conference will be held October 13-14, 2009 at the Ronald Reagan Building in Washington, D.C.
At the Masters Conference, the Deloitte panel will center on how early case assessment technology is poised to radically change how companies approach e-discovery. Moreover, the panelists will discuss how early case assessment can not only deliver cost savings, but also enable corporations to adopt innovative strategies focused on discovery, data privacy, data loss, and general records and information management. Since 2006, the Masters Conference has brought together experts and leading professionals from law firms, corporations and the bench to discuss strategies, practices and resources for managing the information lifecycle. The Masters Conference is an intimate forum where legal industry professionals can share, collaborate, and obtain master knowledge of the most relevant topics in the legal industry today. By limiting attendance to 450 delegates, the Masters Conference is meant to be an exclusive opportunity to learn and network with the top legal professionals in the industry without battling large crowds and an overwhelming vendor hall. For additional information on the 2009 Masters Conference, please visit www.themastersconference.com. As used in this document, "Deloitte" means Deloitte Financial Advisory Services LLP, a subsidiary of Deloitte LLP. Please see www.deloitte.com/us/about for a detailed description of the legal structure of Deloitte LLP and its subsidiaries. Los Angeles, CA (PRWEB) September 30, 2009 -- Los Angeles-based American LegalNet, the premier provider of 'Desktop to Courthouse' workflow technologies that reduce risk and minimize cost, and Hyperion Global Partners, a global consultancy to the legal and intellectual property professions, today announced a partnership. The companies are joining forces to bring the legal market a revolutionary set of workflow products and services to help law firms increase their efficiency while reducing their costs. "We are excited to be partnering with Hyperion. They truly understand law firm best practices and with their expertise and our product offerings, we will be able to provide a revolutionary set of tools for law firms to increase their total efficiency," stated Erez Bustan, CEO of American LegalNet. "In addition, this offering will reduce costs for law firms - a necessity in today's economy." In addition, this offering will reduce costs for law firms - a necessity in today's economy. Both our companies strive to help our clients realize meaningful process efficiencies and practice effectiveness by addressing the tasks on the ground. By leveraging our combined core competencies, we can bring focused new products and services to our legal community to help our colleagues deal with the real-life problems lawyers face every day. The companies will each be calling upon their areas of expertise to create a joint framework for new workflow solutions to the legal market. Through this strategic partnership the companies -- American LegalNet, the leading forms and docketing solutions provider in the market, and Hyperion, the consultancy widely recognized for thought leadership and experience in technology and process improvement initiatives for the AmLaw 200 law firms -- will work together to bring practical and actionable best practice solutions to the global legal marketplace. "American LegalNet is known for their easy-to-use workflow technologies and we are pleased to be partnering with them," stated Eyal Iffergan, President and CEO of Hyperion GP. "Both our companies strive to help our clients realize meaningful process efficiencies and practice effectiveness by addressing the tasks on the ground. By leveraging our combined core competencies, we can bring focused new products and services to our legal community to help our colleagues deal with the real-life problems lawyers face every day." American LegalNet, the premier provider of 'Desktop to Courthouse' workflow technologies, has been delivering innovative, high-quality legal products, content and services to enhance workflow efficiency, minimize risk and reduce cost for more than 12 years. American LegalNet provides an industry-leading suite of products: eDockets, Forms WorkFlow and eFiling Portal; and offers a robust menu of supporting professional services. American LegalNet is headquartered in Los Angeles, California. For more information, visit www.AmericanLegalNet.com. Hyperion Global Partners is a premier global consultancy to the legal and intellectual property professions. Hyperion GP works with AmLaw 200 law firms and Global 1000 corporations to manage the challenges of their business - operational, process, organization and technology management issues - in key business management and applications areas that Hyperion knows better than anyone else. Hyperion is focused on helping our clients maximize return on their existing investments and to make smart, considered decisions about implementing new systems and processes designed to produce the most value on day one. For more information, visit www.hyperiongp.com. BoxTone(R), the expert in mobile user management, today announced the release of the new research report entitled Mobility Management to Drive Compliance for Employee-Liable Devices and Lower TCO, produced by Aberdeen Group, a Harte-Hanks Company. The critical finding: 50 percent of Best-in-Class organizations have used Mobility Management solutions to reduce the risk of employee-liable mobile devices, while lowering TCO per mobile employee by 33 percent. Columbia, MD (PRWEB) September 30, 2009 -- BoxTone(R), the expert in mobile user management, today announced the release of the new research report entitled Mobility Management to Drive Compliance for Employee-Liable Devices and Lower TCO, produced by Aberdeen Group, a Harte-Hanks Company (NYSE:HHS). With Mobility Management, organizations can ensure corporate compliance while they reduce liability and total cost of ownership. Without it, organizations are in danger of getting crushed under rising support costs and compliance issues that can drive overhead costs through the roof. Organizations need to ensure that they are integrating mobility management strategies and IT solutions in a way that allows them to not only say yes to connecting employee-liable devices into the corporate network, but also gives them the ability to reduces the risks and support costs associated with providing access to these devices. As a co-sponsor of the research report, BoxTone highlights some of the key findings, which include that 50 percent of Best-in-Class organizations have turned to Mobility Management solutions to reign-in potential device chaos, control support costs and ensure compliance with corporate standards for mobile IT policy. Applying Mobility Management, these same organizations also demonstrated over a 12-month period a substantial 33 percent reduction in per mobile employee Total-Cost-of-Ownership (TCO) as compared to industry Laggards. According to Aberdeen's research, the case for Mobility Management is made even more compelling due to the growing invasion of new mobile devices connected to the enterprise but procured by employees (also known as employee-liable devices), which increased four-fold in 2008. In addition to growth of employee-liable devices on the RIM BlackBerry, Microsoft Windows Mobile and Symbian mobile platforms, momentum has built behind the Apple iPhone, Google Android and Palm WebOS platforms. "While employee-liable devices promise organizations the opportunity to quickly reduce device acquisition costs, they also create a new set of challenges for IT that may end up negating any costs savings that the offloading of device ownership has to offer. Mobility Management is key to capitalizing on the rapid growth of employee-liable devices," states Andrew Borg, Senior Research Analyst, Wireless & Mobility at Aberdeen. "With Mobility Management, organizations can ensure corporate compliance while they reduce liability and total cost of ownership. Without it, organizations are in danger of getting crushed under rising support costs and compliance issues that can drive overhead costs through the roof." Those interested in a complimentary copy of the full report should register now for the joint Aberdeen and BoxTone Webinar on October 22 at 2:00 PM EDT. Webinar attendees will learn why Aberdeen calls proactive Mobility Management the best way for organizations faced with a rapidly changing multi- platform, multi-liable mobile environment to lower their TCO per mobile employee, maximize mobile user productivity and lower security risks. Takeaways will include 5-step set of Best-in-Class recommendations for taking control of a mobile infrastructure. "While the pressure on enterprises to support employee-liable devices will continue to grow, smart organizations are looking for ways to reduce costs," stated Alan Snyder, CEO, BoxTone. "Organizations need to ensure that they are integrating mobility management strategies and IT solutions in a way that allows them to not only say yes to connecting employee-liable devices into the corporate network, but also gives them the ability to reduces the risks and support costs associated with providing access to these devices." Other key findings from the Aberdeen report include: within the next 12 months, 87 percent of the Best-in-Class expect to have centralized Mobility Management capabilities versus 63 percent of all others; applying Mobility Management, the Best-in-Class reduced over a 12 month period the number of lost or stolen devices "not decommissioned" by 12 percent (compared to a 2 percent increase for Laggards), helping to dramatically reduce liability issues; and Laggards saw their mobility support desk costs increase by 17 percent over a 12 month period, versus the Best-in-Class who lowered support desk costs by 4%, a 21% differential. To access the full research report, and learn more about Aberdeen's 5-step set of Best-in-Class recommendations for taking control of a mobile infrastructure, register now for the joint Aberdeen and BoxTone Webinar on October 22, 2:00 PM EDT. As a Harte-Hanks Company, Aberdeen plays a key role of putting content in context for the global direct and targeted marketing company. Aberdeen's analytical and independent view of the "customer optimization" process of Harte-Hanks (Information - Opportunity - Insight - Engagement - Interaction) extends the client value and accentuates the strategic role Harte-Hanks brings to the market. For additional information, visit Aberdeen or call (617) 723-7890, or to learn more about Harte-Hanks, call (800) 456-9748. BoxTone software is trusted by more than 230 of the world's leading enterprises and government agencies, including 65 in the Global 2000, to manage, monitor and support their BlackBerry platforms. Built on patented SmartMP(TM) technology and conforming to industry standard ITIL best practices, BoxTone's modular platform and role-specific consoles enable IT and services organizations to proactively improve mobile performance, reduce support costs and accommodate rapid device growth, all while guaranteeing the high quality of service that mobile users demand. Learn more from the expert in mobile user management at www.boxtone.com, or call 1 410-910-3344. BoxTone and the BoxTone logo are trademarks of BoxTone, Inc. The BlackBerry and RIM families of related marks, images and symbols are the exclusive properties and trademarks of Research In Motion Limited. All other product or company names mentioned are used for identification purposes only and may be trademarks of their respective owners. IDS Legal, an ISO 27001 and ISO 9001:2000 certified leader in discovery LPO (legal process outsourcing), announced today legal support services industry veteran Jay Koza has been named president of IDS Legal. In his new role, Koza will lead IDS Legal's global operations and will advance the company's mission to strengthen its position as a leader among discovery-focused LPO service providers. New York, NY (PRWEB) September 30, 2009 -- IDS Legal, an ISO 27001 and ISO 9001:2000 certified leader in discovery LPO (legal process outsourcing), announced today legal support services industry veteran Jay Koza has been named president of IDS Legal. In his new role, Koza will lead IDS Legal's global operations and will advance the company's mission to strengthen its position as a leader among discovery-focused LPO service providers. As a pioneer and leading discovery LPO, IDS Legal leverages highly skilled resources and 24/7 operations to deliver high-quality, comprehensive document review and e-discovery services to corporate legal departments of the Fortune 500 and their outside counsel, as well as other premiere litigation support and e-discovery services providers. Expanding IDS Legal's U.S.-based sales and management team is part of a strategic growth initiative to better support both existing and prospective new clients. Mr. Koza is among the foremost authorities of the litigation support industry, bringing almost 30 years of experience working with law firms and corporate legal departments to leverage technology and proven processes in the delivery of comprehensive litigation support services. As the industry has evolved, so too has Koza's range of expertise which includes document review, all aspects of electronic discovery, outsourcing and global processing. Koza recently served as senior vice president and managing director of discovery services for Pangea3, where he managed key strategic relationships and new business development. Prior to that, he worked in business development for Huron Consulting Group, Superior Glacier, Inc., Merrill Corporation and Uniscribe Professional Services. He began his career in the legal support services industry with Aspen Systems, where he worked for 18 years and served as vice president of litigation support. "As a leading discovery LPO, IDS Legal's ability to attract industry veterans of Jay's caliber is among the qualities that set us apart. His expertise and contributions will help IDS achieve our objective of expanding IDS Legal's presence in the U.S. and maintain our commitment to delivering high quality service and unmatched value for our clients," said Partap Aggarwal, CEO of IDS Infotech Ltd.
Mr. Koza is a member of the American Bar Association, New York State Bar Association and The Sedona Conference. He received his J.D. from St. John's University School of Law. IDS Legal is a division of IDS Infotech Ltd., (www.idsil.com) an ISO 27001 and ISO 9001:2000 certified IT solutions provider with operations in the U.S., India and Europe. A pioneer in the legal process outsourcing (LPO) industry with expertise in document review and the discovery phase of litigation, IDS Legal has been serving the needs of Global 2000 corporations and leading law firms worldwide since 1999. Visit us at www.IDS-Legal.com. Three Boston Lawyers in the practices of Medical Malpractice Law and Personal Injury Litigation are selected for inclusion in Best Lawyers® 2010 -- Andrew C. Meyer, Jr., Robert M. Higgins, and William J. Thompson. Boston, MA (PRWEB) September 30, 2009 -- Lubin & Meyer PC is pleased to announce that three of its Boston trial attorneys have been named to the 2010 edition of Best Lawyers®, the oldest and most respected peer-review publication in the legal profession. Founder Andrew C. Meyer, Jr. has been named every year since Best Lawyers inception in 1995 in both Medical Malpractice Law and Personal Injury Litigation. Robert M. Higgins, has been named each year since 2008, and is selected in the category of Medical Malpractice Law. This year, William J. Thompson joins their select company, named to Best Lawyers® 2010 under the practice area of Personal Injury Litigation. We continue to believe -- as we have believed for 26 years -- that recognition by one's peers is the most meaningful form of recognition in the legal profession. $1.75 million: Largest medical malpractice verdict of year (NH, 2008). Located in Boston, Massachusetts at Government Center, the firm's lawyers are licensed to practice in Massachusetts, New Hampshire and Rhode Island. Because of the rigorous and transparent methodology used by Best Lawyers, and because lawyers are not required or allowed to pay a fee to be listed, inclusion in Best Lawyers is considered a singular honor. Steven Naifeh, Managing Editor of Best Lawyers, says, "We continue to believe -- as we have believed for 26 years -- that recognition by one's peers is the most meaningful form of recognition in the legal profession." For more information on Boston, Massachusetts law firm Lubin & Meyer PC, including news on medical malpractice verdicts and settlements the firm's lawyers have achieved on behalf of their clients, please see the firm's web site at lubinandmeyer.com. Known for victim advocacy and high profile cases involving crime victims, personal injury and wrongful death, the Law Offices of Jason Turchin today announced that a member of its practice, Nefra MacDonald, has received state certification as a Victim Service Practitioner. We need to fight for answers and just compensation, and try to empathize with our clients. They didn't ask to be in the unfortunate situation. The least we can do is care. Weston, Florida (PRWEB) September 30, 2009 -- Known for victim advocacy and high profile cases involving crime victims, personal injury and wrongful death, the Law Offices of Jason Turchin today announced that a member of its practice, Nefra MacDonald, has received state certification as a Victim Service Practitioner. "Nefra's training and ability as a victim advocate further promotes the firm's goal of pursuing justice with compassion for our clients," said attorney Jason Turchin. Certified Victim Advocates traditionally serve the public sector through local and county police departments and State Attorneys' Offices, but are not commonly found in private law practices. "We want to stay far away from the 'ambulance-chasing' stigma some people still attach to the personal injury field and focus more on victim's rights. When someone is injured or killed as a result of another's negligence, these people are victims. We should treat them as such," Turchin added. "We need to fight for answers and just compensation, and try to empathize with our clients. They didn't ask to be in the unfortunate situation. The least we can do is care." The Law Offices of Jason Turchin limits its practice to representing victims of accidents, personal injury, crime and wrongful death. Jason Turchin has handled over 4,000 cases and serves as a subject matter expert in these practice areas to the media. His main office is in Weston, Florida, with satellite offices in Miami, Key West, Orlando, Washington, DC and New York. New York auto accident lawyer David Perecman examines the luck that accompanies an unlucky situation. New York (PRWEB) September 29, 2009 -- A 6-year-old girl hit by a SUV was as lucky as you could get according to pedestrian accident lawyers. Even before the ambulances could arrive, she was aided by a group of pediatricians who rushed out from a nearby clinic. "It's never lucky to get hit by a car, but the situation after, was as a lucky as one can get," said David Perecman, a New York auto accident lawyer who has represented his share of auto accident victims. As reported in The New York Post, The accident occurred on East 82nd Street and York Avenue shortly after noon on September 23. The girl was riding a scooter and accompanied by her nanny. She was hit when the SUV driver ran into her while trying to back into a parking spot. "There are so many competing elements in New York, the auto accident lawyer explained, "when watching a child, one needs to be extra vigilant." The pediatricians who were on the scene responded to the girl's screams. According to police, the girl is in stable condition at NYU Medical Center. No charges would be filed for the incident. For the past 30 years, the New York auto accident lawyers, construction accident, personal injury and medical malpractice lawyers at The Perecman Firm, PLLC have championed all types of cases for auto accidents. David Perecman, founder of the Firm, is a Board Director, past Secretary and Treasurer of the New York State Trial Lawyers Association (NYSTLA) and a chair of its Labor Law Committee. 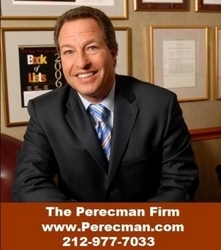 Mr. Perecman's achievements have brought him recognition as an Honoree in the National Law Journal's Hall of Fame, in New York Magazine's "The Best Lawyers in America", 2008-2010 and The New York Times Magazine "New York Super Lawyers, Metro Edition", 2007-2010. The Firm has recovered millions of dollars for its clients. Among the more recent victories, Mr. Perecman won a $15 million verdict* for a construction accident, a $5.35 million dollar verdict** for an automobile accident, and a $40 million dollar structured settlement for medical malpractice.